Well, it’s been about a month since my post, The New Normal. Just a few days after it was published, my Meme drove me back to Pennsylvania so I could check into the hospital. I was there for about 5 days and they told me the usual: dehydrated, malnourished, etc. I knew that would be the case considering I couldn’t keep food or liquids down for almost two weeks! I told them I want a real answer though. WHY wouldn’t anything stay down. You know your own body and you know when something is wrong and I certainly knew something was wrong. They did some X-rays and CT scans and it turns out I had a kink in my small intestine, they kept using the word ileum. Essentially, my intestine was twisted. It could have been caused by the surgery or a hernia, but I’m sure you all can assume which one I believe. Without treatment, it could have lead to the death of that part of my intestine (awesome) or a life-threatening infection. Good thing I pushed them to do more tests eh! 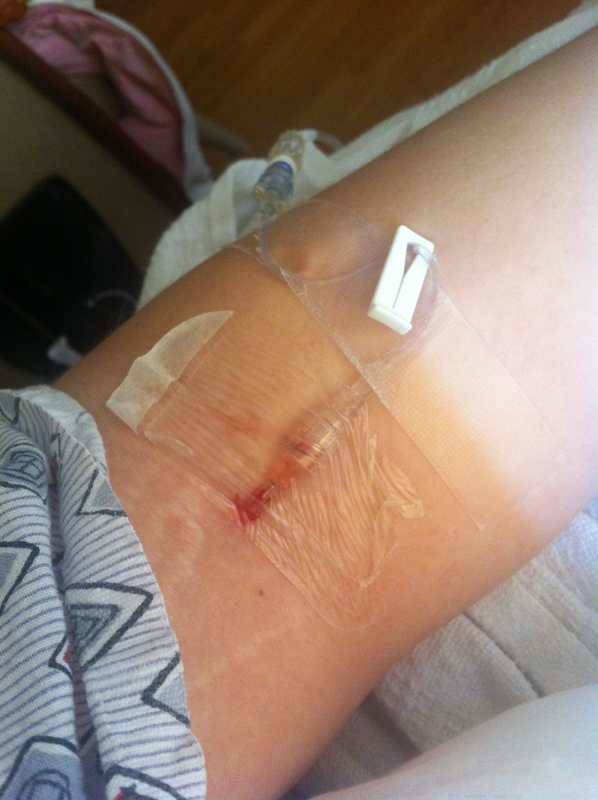 I was treated with medicine, intravenous potassium (horribly painful by the way) and back to a clear liquid diet I went. They did more tests before I left, but everything was working itself out so I was cleared to leave. After being released, I felt pretty good. I found that every day I was feeling better and better physically. The constant nausea and vomiting stopped, I was feeling less and less dizzy and I could finally get out of bed and shower like a normal human. Not the new normal, a real normal human. I’m still struggling with thrush/yeast infections. I was actually told that this could work in my favour in the future. The constant yeast infections could be reason for it to be medically necessary to have my excess stomach skin removed. Who would say no to my insurance company paying for that? Not me! However, it’s super annoying and I hope it at least gives me a break for the holidays. It’s almost been four months since my first surgery, so last week I was back in my surgeons office for a check-up. Despite all of the complications, the surgeon’s assistant was pretty pleased with my progress. He said that I’ve lost more than most people at their practice (no wonder I was essentially dying alive for 3.5 months) and that I was certainly going to be a success story. We discussed what was going on currently and set some new goals. 1. Protein – I could barely eat so I wasn’t meeting my protein goals but since the last hospital visit I was doing great with it. I was getting in around 80 grams a day. He told me 50-60 is good. I’m doing well with that. 2. Liquids – I couldn’t keep anything down before but now that I can I have to do better at getting in 64 ounces of water a day. I would say that going into the appointment, I was getting around 48. I’m working up to 64 ounces and I can see it getting easier every day. 3. Exercise – Obviously, I hadn’t been doing any up until this point. I had been cleared for light walking but even that was a struggle. Now that I’m feeling so much better, I know I’m ready. I’m actually excited for once. I already joined a gym in Pennsylvania so I can start over the holidays. I’m just going to start with cardio. My next appointment will be at the 6-7 month mark. Wow, it seems like it’s going so fast now. Anyways, I’ve set some goals of my own for the next little while. My 22nd birthday is coming up and I’m having my birthday party on January 25th. My goal is to be under 200 pounds by then! That would be the best gift I could give myself. I will keep everyone updated! Tags: bariatric, bariatric surgery, gastric bypass, gastric bypass fluids, gastric bypass protein, health, healthy, ileum, intestinal kink, intestinal kink after weight loss surgery, obese, rny, weight loss surgery, wls, working out after weight loss surgery. Bookmark the permalink. Hilary, you are doing great. Way to stand up for yourself when you weren’t getting satisfactory answers. I’m so happy that you are doing well now and I love your goal for your birthday.